Life On Willie Mae Lane: Plates, Roses, a Little Makeover! I don't know about you, but I am thankful to see Saturday here at last! I have had such a busy week and am in need of the R & R the weekend brings. I have just a few things to share today from the past few days. Earlier in the week, I hung my new plates, but decided not to add them to the plate wall for now. I hung them on a different wall and really like the way they look here. On the way home from work yesterday, I had to stop and get some groceries and they had bouquets of roses for $4.99! For that price, I had to have some for my dining room table. 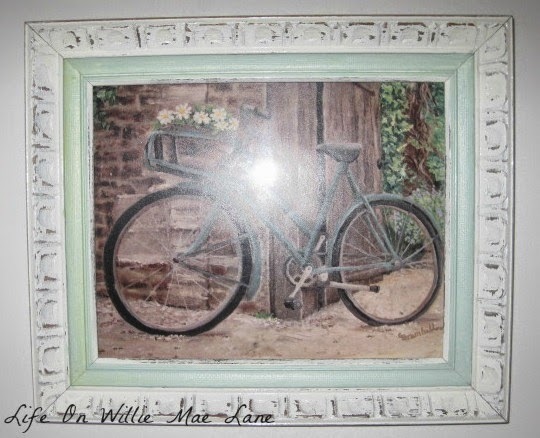 I finally got my bicycle print framed. I redid the frame.,,,it was all white and very plain. I added the green and distressed the white and now I love it! It is perfect for the print! And...it is the perfect addition to the guest room. because this beautiful girl is coming home! And as soon as she gets here, we have to dash out the door for a family reunion! Looking forward to seeing my sweet cousin from Canada and her family. 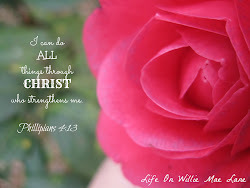 Prayers for a lovely weekend and Happy Mother's Day to all you mothers out there. your plates are adorable and so is your daughter! I love your bike print! Happy Mothers Day to you also! Sounds like you've been as busy as can be. Your big red roses are gorgeous and just in time to be in full bloom for Mother's Day. Hope you have a great time with your daughter home. 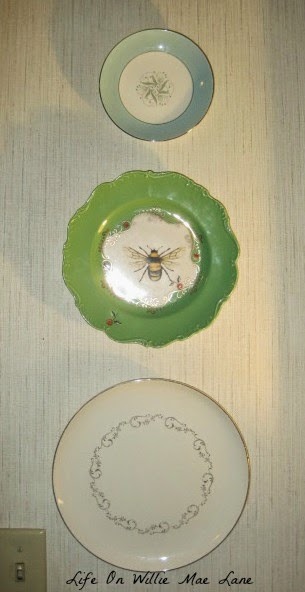 I thought surely the bee plate was coming here to visit for awhile! Love the arrangement. So glad Miranda is staying the weekend - enjoy the family reunion. Your guest room... I love chenille! Very nice Vicky. Vicky, wishing you a wonderful Mother's day! I know it will be with your sweet girl home! I'm blessed to spend this day with my Mom this year!